This is my contribution to operating sessions on the SP Clovis Branch being built by my friend Pierre Oliver. As part of preparing the materials for this feature, I needed a photo of the finished locomotive doing its thing – and it seemed only appropriate that I do that on the layout for which I modelled the engine. So yesterday I descended on Pierre’s basement with SP 1010 and piles of camera gear. It has been a long time since I’ve taken photos for a magazine, and my skills are rusty. There’s a process I go through when shooting a photo – for example, checking the four corners of the viewfinder for undesirable elements such as shadows that may have crept into the background, and checking that all wheels are on the track. Obviously, I forgot about this – a number of images I took, including the one above, had derailed equipment in them. Unfortunately, derailed equipment is always the first thing I see when a photo is in print in a magazine, and it’s usually hard to fix derailments in PhotoShop. To further complicate matters, Pierre lives 2.5 hours down the highway from me, so it’s not like I could just shoot replacement pictures – not without another full day of travel. Lesson learned: remember my mental check lists. I’ll do better next time. The good news is, I did manage to get a shot that will work for the article, so the day’s objective was achieved. The feature is scheduled to appear in the June, 2019 issue of RMC. While at Pierre’s we did some other stuff too. We discussed the location of the scale track in Friant – something that has been bothering us both pretty much since I drew the layout plan for his California adventure. We also decided on locations for throttle plug-in panels, and discussed what sorts of structures should line Tulare Avenue in East Fresno – a place where the Clovis branch went down the middle of the street. Before leaving, I wandered about the layout room, admiring Pierre’s progress. I can tell that he’s really enjoying this layout – more, I think, than his previous effort (The Wabash through Southern Ontario) – because every time I visit, there’s more done. A lot more. What do you do if you like large scales but don’t have lots of space? Adjusting your goals to embrace large models of small prototypes is one approach. Years ago I picked up this delightful O scale model. It’s a 1921 Mack 33-Ton switcher, produced in brass by Lee Town Models. As the Canadian two-dollar coin shows, it’s tiny – less than 4.5″ over the footboards. Despite its diminutive stature, the model has a can motor between the frames and runs beautifully, while the brass construction gives it plenty of weight. And while I haven’t yet attempted it, I suspect there’s plenty of room belowdecks to squirrel away a LokSound Select Micro, a pair of ESU sugar cube speakers, and a TCS Keep-Alive module – my favourite configuration for DCC and sound these days. But what does this have to do with layout design? Obviously, a 4.5″ long locomotive doesn’t need a lot of room to manoeuvre. More importantly, the prototype – featuring chain drive and a pair of 40 HP engines – wouldn’t be expected to pull a whole lot or conquer grades: It’ll look right at home trundling about with one or two cars in tow. While it’s not necessary to build a small layout for a one-car or two-car train, such an endeavour can become a showcase for fine model-building. It also provides the opportunity to think outside the box. 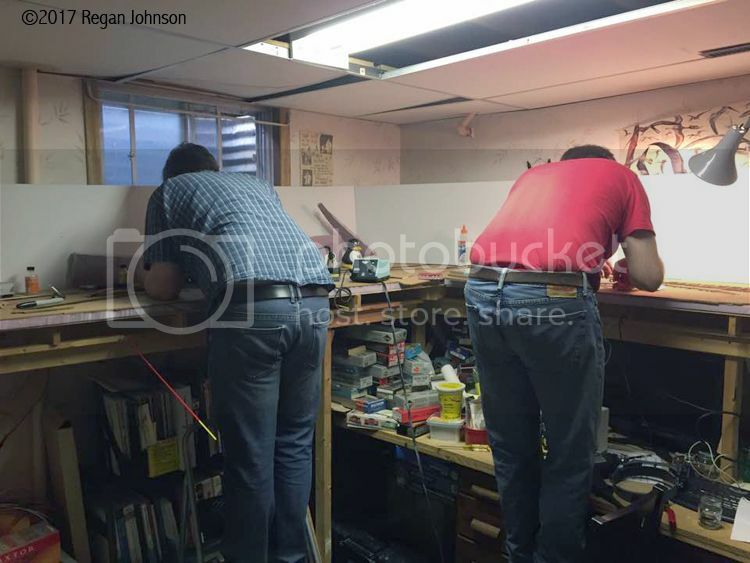 Over on his Prince Street blog, my friend Chris Mears has been developing some ideas for small layouts that do just that, using innovative benchwork configurations. Examples include The Broken View / The Overlap and The Matchbox. Finally, the Mack switcher is not the sort of unit one expects to find in wide open spaces: Critters like this would’ve worked in mills or factories as in-plant switchers. That suggests a layout built around such a locomotive would feature vertical scenery – brick canyons and concrete silos – which would trade real estate for air rights. An example of “going tall” – in O scale no less – is 13th and North E, an urban cameo by Mike Cougill. The Mack 33-Ton switcher would look right at home in Mike’s warehouse-dominated environment. Layout designs are influenced by many choices. Typical ones include favourite scale, favourite era, favourite prototype and favourite theme. 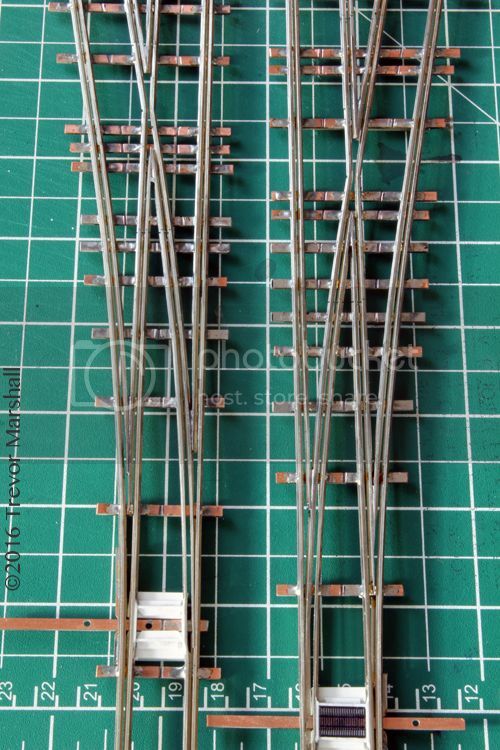 Sometimes, layouts are designed and built because a manufacturer has produced a piece of favourite equipment – some examples include the many O scale railroads inspired by the Maine two-foot gauge lines, but built in On30 to take advantage of Bachmann’s 2-4-4T Forney locomotive. I expect that we can now add to those influences, a favourite DCC throttle. Scott Thornton, Michael Petersen and Nathan Holmes have teamed up to create the ProtoThrottle, which is manufactured and sold through Iowa Scaled Engineering, co-owned by Michael and Nathan. This is a wireless DCC throttle that replicates common functions on a diesel control stand in a realistic manner. Instead of a speed knob, there’s a throttle handle that provides eight notches plus idle. Instead of a toggle or push button, there’s a three position reverser handle. Instead of assigning a function button to the brake, there’s a progressive brake handle with built-in resistance. Instead of a button for the horn, there’s a spring-loaded handle. And so on. The controls are mounted on an aluminum anodized faceplate with clearly engraved markings, as shown in the lead photo. What does this have to do with layout design? A lot. The ProtoThrottle team started taking pre-orders in April, for a run of 150 throttles. (I suspect those sold out quickly. If so, I suspect another run will be done, soon.) Now, people who placed pre-orders are receiving their throttles and hooking them up to their layouts. The feedback has been overwhelmingly positive. For such a sophisticated piece of equipment, set-up is relatively straightforward. It’s not completely plug and play: depending on your DCC system, you may have to adjust some configurations on the receiver, but the instructions walk the user through that. And if you’re still having trouble, there’s an excellent online user group. Based on the posts to the ProtoThrottle IO group, there have been a few teething issues – some involving set-up and the tweaks one must make to the receiver to interface it with one’s DCC system, others involving tuning DCC decoders from various manufacturers to optimize how they respond to the ProtoThrottle. But Scott, Michael and Nathan are part of the user community. They have been wonderful about sharing progress on the development of these, and are now doing an amazing job of helping customers get up and running. They are assisted by the many customers who have successfully set up their throttles – and are now doing a terrific job helping others get onboard. They’re not just answering questions: They’re shooting and sharing videos showing how to set up the throttle or configure various brands of decoders. The best part is, those who are now running trains using their ProtoThrottle are sharing glowing reviews. As expected, it’s changing the way they run their layouts – for the better. And this is where layout design comes in. The combination of this control stand and today’s DCC decoders – which deliver exceptional motor control and impressive sound – kind of screams out for a shelf-style switching layout in one of the larger scales, such as O. A four-axle road switcher – a GP-9, RS-11, or RS-3, for example – would have plenty of space for a large speaker, and in O scale it would be large enough to really convey the mass of the real thing. A shelf-style configuration, mounted high on the wall, would ensure that viewers are always up close to the action. And the use of hand-thrown turnouts (perhaps controlled by garden scale switch stands) and prototype-action couplers (such as these ones offered by Protocraft) would put the operator right in the scene. What better way to run such a layout than with a miniature control stand? Even a small locomotive – such as this S scale GE 44-Tonner on my Port Rowan layout – will be more fun with this control stand. While my home layout is definitely set in the steam era, I do have a couple of pieces of motive power run by internal combustion engines – and I think they’ll be seeing a lot more track time once I set up the ProtoThrottle. I’m looking forward to it! I recently learned that Phillipe Cousyn – a talented hobbyist in the Paris (France) area, is modelling the San J – and he’s doing it in 1:64. In September, I was fortunate to attend an NMRA regional convention in Ontario, California. After the convention, I had a couple of days to do some sightseeing – and since it was close by, my friend Michael Gross and I visited the restored ATSF train station at Perris, California. This is a special place for me – and for other students of layout design. That’s because Perris was the signature scene on the ATSF San Jacinto District – a ground-breaking layout plan by the late Andy Sperandeo, published in the February 1980 issue of Model Railroader. We visited the depot on a Sunday afternoon – unfortunately, the museum inside had closed its doors about five minutes before we arrived. That’s okay – it was a busy day, filled with other activities, and it was enough to see the depot in person and take a few photos before moving onto our next stop. – Typical designs of the era tended to be packed with track for running and switching. 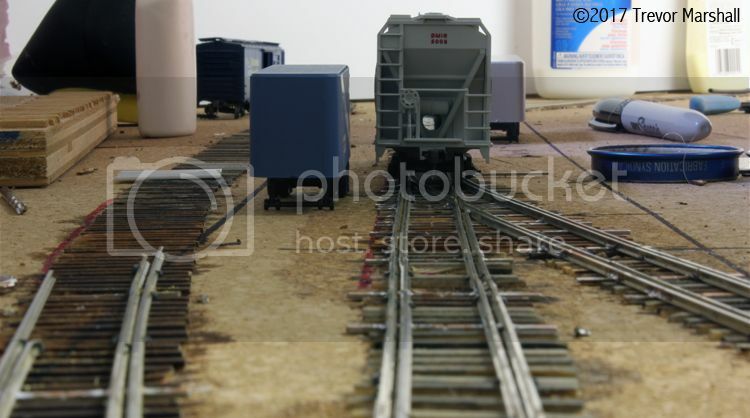 This layout is open and relaxed – there’s a more realistic track to scenery ratio. 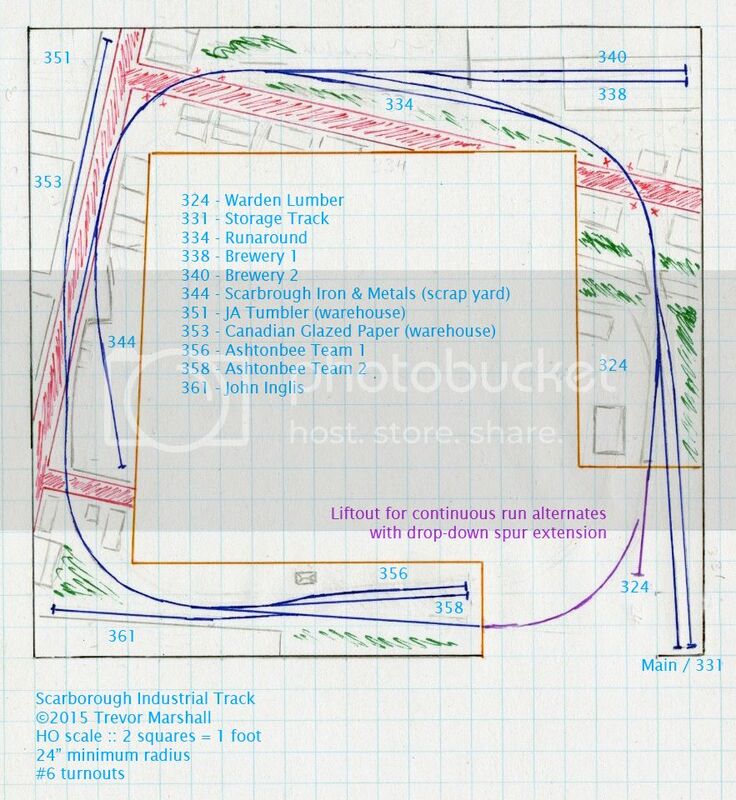 – It’s also a point to point plan with an easily accessible staging area: It was meant to be left open, or perhaps hidden behind hinged panels, and was intended as an active staging yard where the layout builder could fiddle cars on and off the layout between operating sessions. Devoting an entire wall to easily accessible staging (instead of a yard hidden under the visible deck) was a radical concept in the 1980s. Making it an active fiddle yard even more so – at least in North America. – The layout was designed with a strong theme and purpose. Many layouts of the era – especially smaller layouts like this 9×12 foot design – seemed to have operations grafted on after the fact. But the San J had a clear concept. Andy even introduced the idea of using the changing seasons to add variety to the operating sessions, by describing how the harvest season would change the operations on the layout. The layout was definitely ahead of its time – and, in fact, still stands up to today’s thinking on layout design. All it needs is, perhaps, larger curves and turnouts (and a little more room as a result) but the basic concept and the track plan remains an excellent choice for a model railway. On Sunday, Mark Zagrodney and I enjoyed a day-long work session on the CP Rail Scarborough Industrial Track that Regan Johnson is building around the walls of his home office. As I noted in the linked post, I built two in-street turnouts – serving the spurs along the left side of the plan. These are not, strictly speaking, prototypical for the spur line that’s inspired Regan. But I thought the street-running and in-street switching would add significant visual and operational interest, and Regan agreed. Since they were my idea, I felt it unsportsmanlike to force Regan to tackle the in-street turnouts. Plus, I was curious whether I could build them. So I did – well over a year ago. Regan has been very patient, waiting for this work session to take place. But he hasn’t been idle. Almost all of the rest of the track has been installed. In fact, we managed to lay the main through the street in both directions, and link it up to the team track area at the bottom of the plan. There’s only about three feet of track to spike in the upper left corner, and the mainline will be finished. Over on my Port Rowan blog, a recent post – “Roweham 2017” – generated a lot of discussion about how we present our layouts to others. Roweham is a well executed exhibition layout built by my friend Brian Dickey to 7mm scale (British O scale / 1:43). It provides many valuable lessons about presentation that can be applied whether one is taking a layout on the exhibition circuit, or planning a home layout. I encourage you to read through the comments on that post if you have not. On the question of “professional presentation” I include some photos of McCook’s Landing, the Civil War roadshow layout that Bernie Kempinski and I – plus a few other folks including Paul Dolkos – built to take to some shows a few years back. 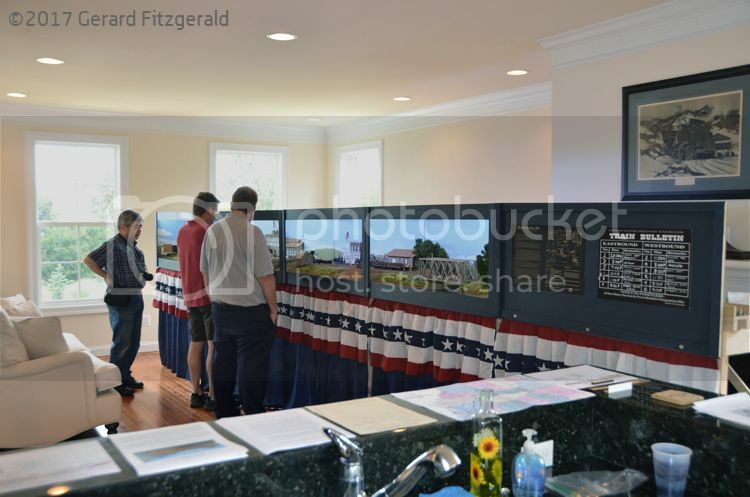 A great deal of planning went into this freelanced layout, which allowed us to introduce O scale Civil War model railroading to people at a national and regional NMRA convention. 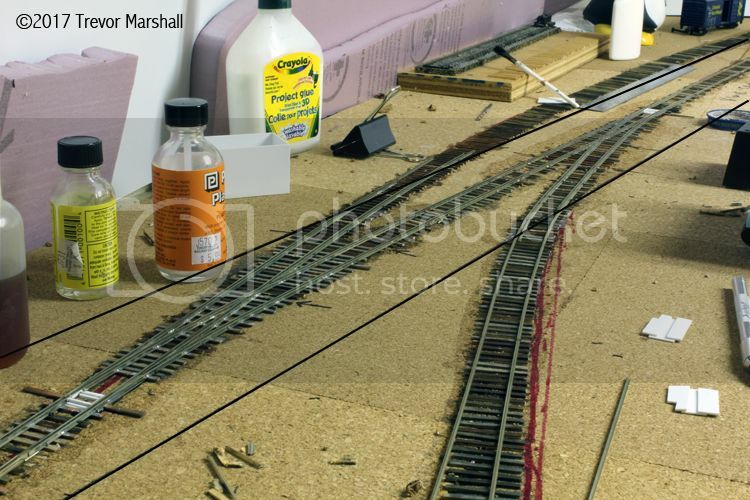 These photos were taken when the layout was set up in my living room a few years back for an NMRA home open house. The layout was designed to be as photogenic and presentable as possible. 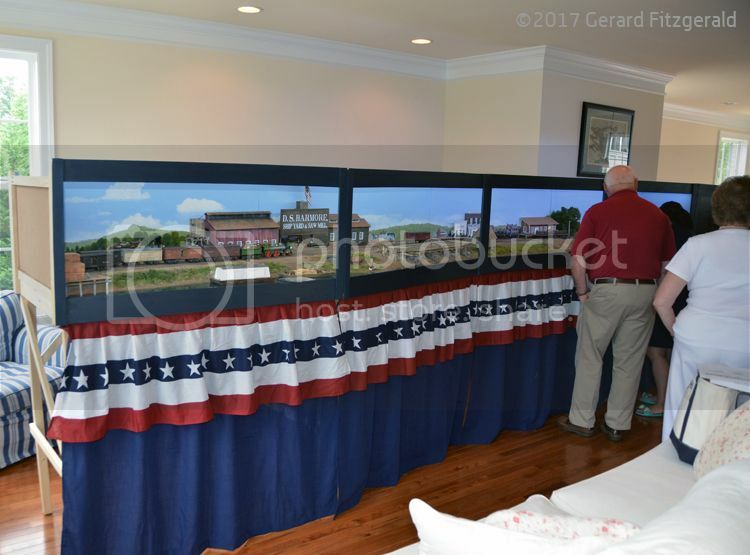 Bernie’s mom made the curtains and also probably the red white and blue bunting. Much time was spent on designing a layout that was similar to a British exhibition layout but which captured a very rare American prototype. O scale Civil War is probably even a bit smaller than the equipment used at Roweham and so operations were pretty interesting. The layout had a small fiddle yard behind the schedule/chalkboard. We received a great deal of positive attention when the layout was displayed and it was a very big attraction at the Atlanta NMRA National (when people could find the display room). 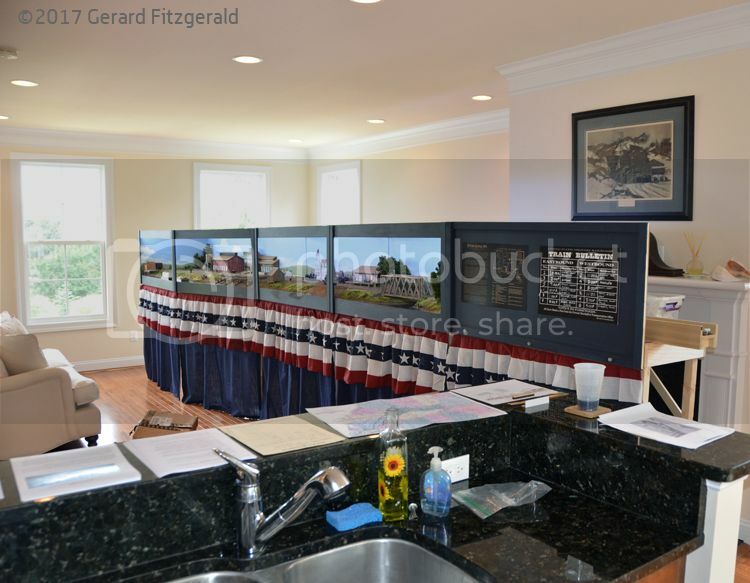 Putting as much effort into the design and construction of a shadowbox/display layout to make it attractive and presentable – to visitors, other modelers, and potential operators – is extremely important. Why people do not always put that much work and planning into small layouts always sort of baffles me. One of the Model Railroader editors later said this design gave them some ideas for one of their later project layouts. For some reason I recall that at both my home open house, and the MER convention, a number of non-hobbyists wound up stopping by and were really intrigued and excited by the layout and that was quite gratifying. I must admit the layout was very impressive in person. We sweated the “window” approach with the vertical supports, which made the individual units stronger and lighter. However in operating and observing from the front you just sort of forgot about them. Bernie and I debated that approach for a while and we were surprised the supports seemed invisible after a while. In the USA, for whatever reason some people seem to associate “presentation” more with home crew lounges than small layouts. Not always but one can go to train shows and see some portable and modular layouts that are, for lack of a better description, unfinished. 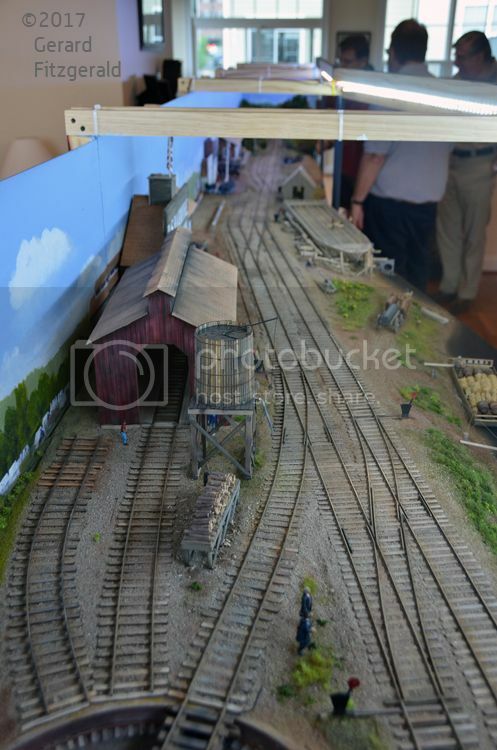 Public shows are about advertising the hobby to some extent, not to mention putting your best foot forward as a layout builder, but the small British display layout approach just hasn’t taken root in the states. Maybe someday … but I doubt it. Sadly Bernie tore his sections down and the only section left is my Biscuit Run bridge unit, which I have downstairs along with the other benchwork components. And yes, the legs were attached and folded down and there was lighting. I need to finally write something up about McCook’s Landing and send it to Model Railroader, which I promised a while back.